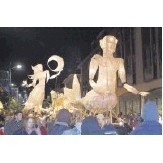 This year, the magical City of Lights festival and parade in Truro’s City Centre takes place on Tuesday, 20th November starting at 7pm. With the theme of ‘NadelikKernewek’ or ‘A Cornish Christmas’, this uniquely collaborative community arts event and a key fixture in Cornwall’s annual festive calendar, promises to rival last year’s spectacle enjoyed by around 15,000 visitors. Leading up to this year’s event, a host of beautiful themed large-scale lantern sculptures for the parade will be created by a team of 13 professional artists working with around seventeen schools, 2 colleges, 3 community groups, 5 youth groups and others from across the city and beyond. As well as the production partners who lead on the work all the year round, Community 1st Cornwall are one of this year’s partners and major sponsors who has invested in what we see as a key element to Truro’s and Cornwall’s community winter celebrations. Community 1st Cornwall have a particular local interest in community projects as they are the Truro based company overseeing the delivery of the flagship Truro Health Park development on the site of the old city hospital, and are sponsoring schools involvement in the festival this year.